The unicorn hitch pictured is Dakota Thunder Shires, driven by Joe Biren and owned by Houston Haugo. Joe Biren views caring for the 12 English Shires that make up Dakota Thunder Shires as similar to his days as a high school football coach. They're athletes, he said, though it could easily be said the Shires get better treatment than the boys of fall. They consume a strict high-protein, high-fat diet, have muscle building days in which they pull weight, aerobic days to work on their lungs and breathing, and days where they just take it easy, getting chiropractic work and MagnaWave to ease their sore bodies. They are shod every five weeks, and their vaccinations and dewormer are administered like clockwork. All of this is to prepare for their time in the spotlight like at the Dakota Royal Charity Draft Horse Show, hosted last weekend at the Swiftel Center in Brookings, South Dakota. 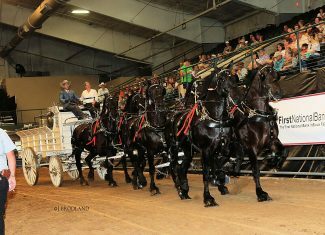 Up to six of the horses show at once in the Classic Series Six Horse Hitch Class, or fewer horses in classes such as Four Horse Hitch, unicorn, which is a single horse leading a team, ladies cart, junior driver, and others. 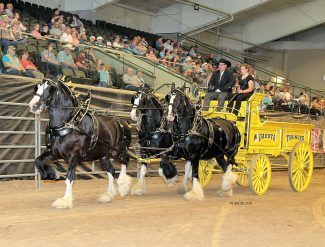 Thirteen teams from 11 states showed Percherons, Shires, Belgians, and Clydesdales. 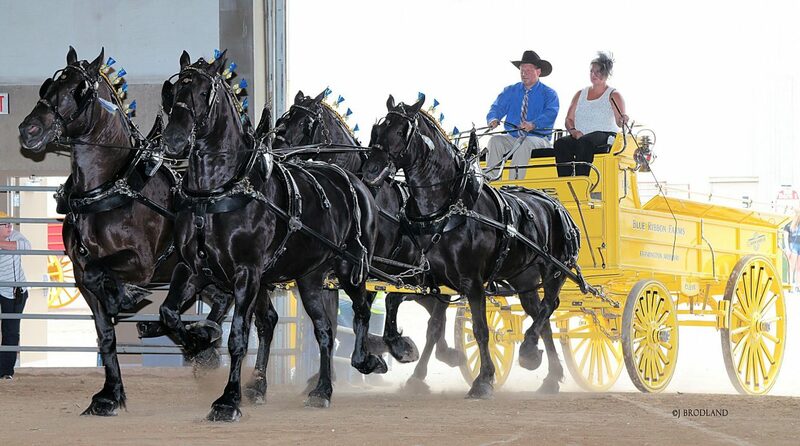 The show, part of the North American Six-Horse Hitch Classic Series, got its start five years ago when Houston Haugo, the owner of Dakota Thunder Shires, came up with the idea of bringing a classic series show to South Dakota. It has grown since the first show in Sioux Falls, South Dakota. The second year, the facilities were booked, so they moved the show to Brookings, where it has been since. "The town of Brookings is always welcoming," said Brandon Kinney, the show day manager. "We love having it in the Swiftel Center; they've been great to work with, so we've kept it there." Team drivers listened closely to the commands of the three judges—Lynn Apenhorse, of Spring Valley, Minnesota, Bob Roby, of Rockwell City, Iowa, and Terry Pierce, of Oakland, Iowa—striving to bring out the best in their teams of two, three, four, or six. "The tricky part of it is trying to get six horses to perform together, keep their gait the same, try to keep a good headset, a good presence about them, have good motion and be equal with their partner and equal with the teams in front or back of them," Biren said. "It's kind of like six kids; there's always one that woke up on the wrong side of the bed and you have to figure out how to work with them that day." A large part of the show, part of its name, is giving back to the community, in particular the youth. For the first time, a silent auction was incorporated into the show weekend last year. The Dakota Royal Charity Draft Horse Show was able to benefit three students in 2017, two of whom attend South Dakota State University, and the last a 4-H member who needed new equipment for draft horse showing, and will benefit more youth this year and beyond. "If a 4-Her needs to buy new harness, they can use some of the money to fund their purchase of a harness or a student needs it for classes or books," Kinney said. "We had quite a few who donated items; there was wonderful stuff donated. We're grateful for it." In addition to helping youth financially and offering youth a place to show their drafts, Biren was able to afford a small joy to a young man named Tyler who has muscular dystrophy. "Life threw him a curveball. He loves horses, and, truthfully, they weren't sure earlier this winter, if this would be a possibility," Biren said. "I feel privileged to do it, fortunate to be asked to do it." Biren took Tyler several laps around the arena on the Dakota Thunder wagon. "His dream," Kinney said, "is to drive a wagon on a six-horse hitch. He got a standing ovation from the crowd. There were a lot of tears in the crowd." 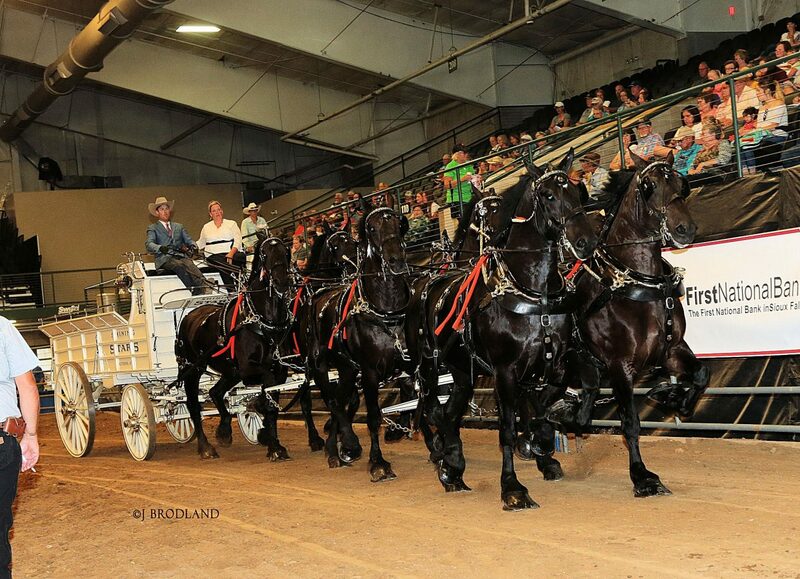 A Belgian owner and the coordinator of the farm team class and feed team race, Mike Olson, was awarded South Dakota Horse Council's 2018 Horseperson of the Year at the show over the weekend. "It's very humbling, to be honest," he said. "To see all the honorees before me, who has been there, I feel really privileged." Olson has been a farrier in South Dakota for more than 40 years and has taught farrier work at South Dakota State University since 2004. 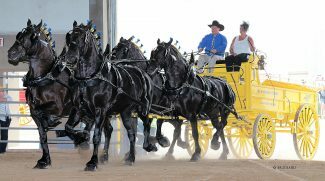 He is passionate about keeping draft horse history alive, showing his Belgians annually at the South Dakota State Fair, in addition to coordinating and competing in the farm team classes. "It goes back where the older generation can still remember when dad or grandpa was farming with horses," he said. "We are preserving some of the history. It's history that younger people might not have seen and older people can reminisce." Five teams competed in the farm team class with several antiques in tow, including a sickle mower, corn planter, and a chuck wagon hitched to three mules. In the farm team race, two teams run side-by-side and stop—or slow—at four stations consecutively. At the first, they must pick up six bales and place them on their sled. At each of the next three stations, they drop two bales. The loop between two cones large enough to fit only one team, then pick the bales up along their way back, depositing all six on the last pallet, before crossing the line. "It's nice for a crowd to have a few different things to look at," Biren said.